Chicken fricassee is a long time family favorite. No one ever passes up seconds of it and my mom is particularly fond of the dumplings that are steamed on top of the chicken. I had no clue how to make it gluten free and hence didn’t serve this at any family Sunday night suppers for the past 21 months. I couldn’t find any savory dumpling recipes that were safe for me as a celiac. Finally, my longing for those homey flavors overcame my fear of extreme experimentation and this recipe was born the other weekend and much enjoyed by all. The dumplings are not quite as tender as the original ones but are a more than reasonable facsimile! Yes, we ate this yummy meal on paper plates…less clean up. 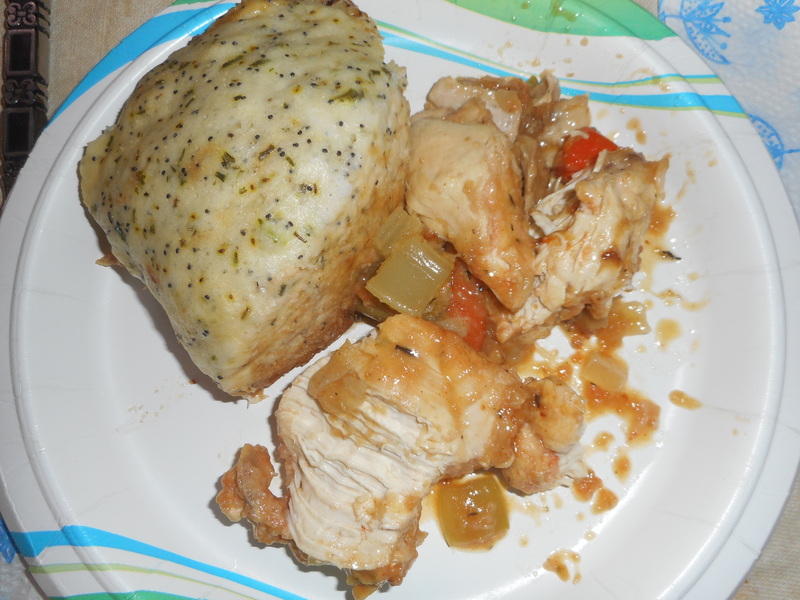 It is a combination of two recipes with a number of additions modifications by me; the dumplings are somewhat based on a recipe from Bette Hagman’s book, More from the Gluten-Free Gourmet and the chicken fricassee recipe is mostly Betty Crocker. Yes, there are a lot of ingredients in this recipe, don’t let that keep you from trying it; there is a lot of dumping together and slow simmering, no fancy cooking tricks or mad kitchen skills are required. If you don’t want so much flavor in your dumplings cut back on the spices/herbs. They do need some herbs so don’t go less than half the listed amounts. If you don’t like all three of those veggies leave out as you wish but each adds seriously great flavor and helps to make this a satisfying one dish meal. Be sure to check the chicken after 30 minutes and add some water if it is low; mine came perilously close to burning the last time I made it. The chicken coating helps to form savory gravy with that water. No gravy is not good either so add water so you end up with at least a cup of gravy. 4-5 pounds cut up mixed chicken parts, bone in. I cut the breasts in half for manageable serving sizes. You could buy a couple packages of chicken parts – what your family likes. I had trouble finding the cut up whole chicken that used to be common at meat counters. I bought a whole chicken and spent a grisly 15 minutes hacking up the beast into serving pieces. Not fun, next time I will get a whole breast and cut it up and use a package of chicken thighs/legs. If you only use breasts cut the cooking time to 30 minutes. 1 large sprig fresh rosemary or ½ tsp. dried rosemary. 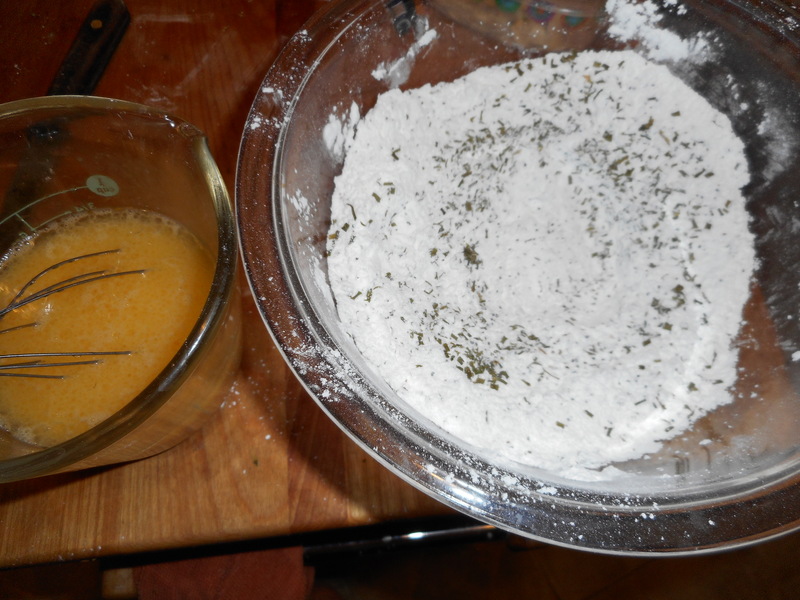 Mix the dry ingredients in a shallow bowl. I take off the chicken skin; up to your preference. Roll the chicken pieces in the seasoned flour. Heat the oil in a thick bottomed large dutch oven. Brown the chicken pieces on all sides; this could take from 8 to 12 minutes. Cut the carrots into 1 inch lengths, same for the celery. Chop the onion. Remove the browned chicken to a large plate, add the veggies and stir for a minute or two. Add back the chicken on top. Top with herbs. Pour in cup of water. Cover, cook on low for 45 minutes. Check after 30 minutes and add another ½ cup water if needed; you want there to be liquid on the bottom or the veggies could burn. Make the dumplings. Mix the wet ingredients and then add to the dry mix in a big bowl. Stir briefly. It will be very wet looking. 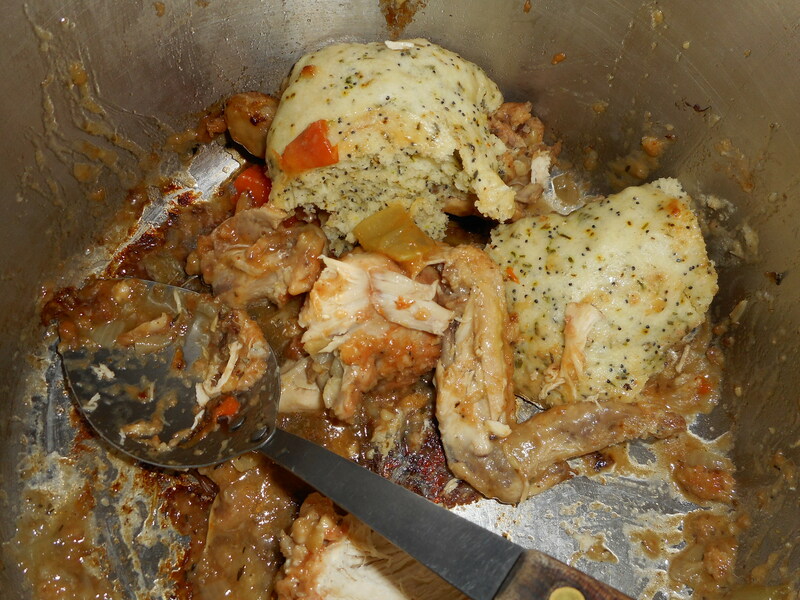 Use a large serving spoon to put large glops of dumpling around the chicken pieces. Cover and cook 25 minutes or until dumplings appear firm (no longer gloppy). The chicken and the veggies should be done by that time. Enjoy! This is the leftovers in the pot. Lunch tomorrow! You could add a salad as a side dish for more veggies. We had a cucumber salad to round out our meal.